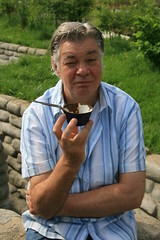 The BBC1 series My Family At War was aired starting 3 November and ended with a final hour long broadcast on 11 November. It took eight personalities to the Great War battlefields to discover what their ancestors did during WW1. Series producer was James Hayes, and individual programme producers were Naomi Austin, Rosie Schellenberg, and Helen Shariatmadari. The first episode had quite contrasting stories, with Dan Snow‘s relative being General Sir Thomas Snow, who served as a Divisional Commander in 1914/15, and then a Corps Commander 1915/18. 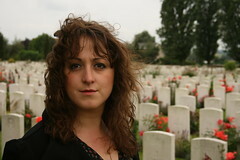 Natalie Cassidy’s relatives were largely involved with life on the home front – her family being bombed out in a Zepplin raid – but one of them worked in a graves exhumation unit on the battlefields of Flanders in 1919/20. Dan was taken to the Château at Pas en Artois where Snow’s HQ was during the Somme campaign; the château had survived the war but been gutted by fire in the 1920s, but some original internal features remained. Here, author Alan MacDonald (author of several books about Gommecourt) related General Snow’s somewhat unfortunate involvement in the battle, and how during a court of enquiry he had blamed failure on his men. Meanwhile Natalie Cassidy was in Flanders meeting museum curator Franky Bostyn and historian Soren Hawkes, to discover what graves exhumation was all about. 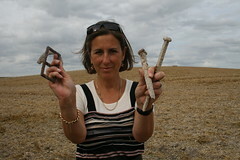 In one scene Natalie was shown a rather grim object used to look for bodies after the war – the look on her face said it all. In this episode Matthew Kelly followed the story of his great uncle, Albert Nugent. Albert was a pre-war regular soldier, who was recalled in August 1914, and posted to 1st Bn East Lancashire Regiment. He went to France within a few weeks, and on 26th August fought his first battle at Le Cateau. He was wounded during First Ypres, returned to the unit in early 1915, was wounded again at Mouse Trap Farm in May 1915, and was shell-shocked on the Somme in early 1916. His war came to an end below the Le Transloy Ridge in October 1916, when he was wounded and taken prisoner, dying of pneumonia – probably accentuated by wounds – in Germany in May 1917. Matthew followed his story from Flanders to the Somme, and was deeply moved by what he saw and found out. He expressed things many people doing similar research into their own ancestors feel, and there is no doubt his ‘human’ approach will be something people will remember from the series. Phil Tufnell looked at his grandfaher’s role as a mechanic in the Royal Flying Corps, giving the programme makers an opportunity to discuss some lesser known aspects of the war. His grandfather worked on and repaired aircraft in France, and also during the defence of Britain, and a highlight of his part of the programme was going up in a WW1 training aircraft. BBC Newsreader Kate Silverton follows the story of her grandfather in this episode. A volunteer who joined the Rifle Brigade in 1914, he was a family man in his late 30s – no ardent youth. A patriot, the child that was born after he enlisted was given the middle name Kitchener. His war began in Flanders, where Kate followed him into the trenches near the Menin Road. She learnt how the conditions were wet and cold, and got to the bones and into the muscle fibre of Rifleman Silverton, and made him ill. A spell in hospital was followed by a move to Arras, where he ended up in the tunnels beneath the city, where the cold and damp finally finished him off. At Arras Kate herself went underground into the Wellington Quarries, something she found profoundly moving. In fact the whole journey was a moving one, which ended with meeting Colonel Peter Starling at the RAMC Museum, where he told her just how bad it had been for the Rifleman. In fact he was probably never the same again. Eamonn Holmes‘ story was a similar one – about a man whose health was wrecked by war. In this case his ancestor, a soldier in the Irish Guards, was badly wounded at Ypres in July 1917. With a shattered pelvis, the injury finally killed him many decades later. 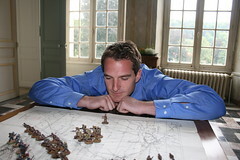 Eamonn’s journey took him into contact with historian Joanna Parker and former warden at Toc H, and now battlefield guide, Jacques Rykebosche. Joanna led him through the Somme, and Jacques set the scene in Flanders where the deadly wound occurred. 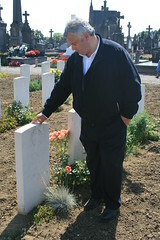 But Eamonn also had time to visit the grave of his great uncle, who died of wounds at Neuve-Chapelle. The death of his brother was why Eamonn’s grandfather had joined the Irish Guards – to avenge. But it had led him a long a very different path, a path that Eamonn also trod, this time to remember. This was the longest episode of the series, running to one hour. It was also originally shown at 9pm and got a huge initial audience, and was perhaps the most critically acclaimed of the four programmes. Kirsty Wark‘s story followed her great uncle, whom her own father had been named after, James Wark. Jimmy served with his local regiment, Highland Light Infantry, and then transferred to the Machine Gun Corps. He served for more than three years in the trenches, seeing almost every major battle from 1915 to the end of the conflict. Awarded a DCM in 1918, he contracted flu just after the Armistice and never saw home again, dying at a CCS near Lille. It was terrible, tragic story brought alive by the fantastic photographs and letters that had been lovingly preserved by the Wark family. Kirsty found it a moving journey, and like others in the series shed genuine tears when confronted with the truth of it all. She also became fascinated with the detritus of war still remaining in the fields of the Somme, amazed that anything at all was still there, let along that it could be related to specific periods and battles. The pilgrimage ended at James’ grave, on a wet September day. She carried with her photos from an earlier family pilgrimage, and had her son James with her, who carries the name down the family still. Rolf Harris‘ story was the most personal of them all, as it followed his father. 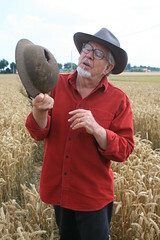 Rolf’s dad had joined up with his brother and fought together just like the ‘two little boys’ of his famous hit song. Rolf had never travelled to the battlefields, and knew little of what he’d done, and was genuinely amazed to find out how many times he’d been wounded, that he was a Lewis machine-gunner, and had served in so many battles. He stood in the field where his father had been wounded in 1917, holding the very helmet he’d worn that day, gashed by shrapnel, still covered in the mud for 90 years ago. That was a very special moment indeed. At the end of the programme Rolf discovered that both brothers were wounded the same day on the Somme in 1918; Rolf’s dad made it back, but his brother didn’t dying of his wounds. And finally all roads led to a small war cemetery in Picardy, where the reality of the lyrics he’d sung so often struck home in a way they had never done before. And so My Family At War came to an end, shedding a little light on the generation of the Great War and showing how it’s cruel hand touched every family in the land. Hope we get the series here in New Zealand eventually 🙂 Rolf rocks too! Will this extremely moving series be shown this November 2015?